I once saw this hyped on eBay as a Kalyanji Anandji funk score. Instead of showing the album's front cover (which under the circumstances probably would have been off-putting), the seller opted for the back, featuring a picture of Amitabh Bachchan fronting a bunch of nasty looking bikers. Bids went sky high. 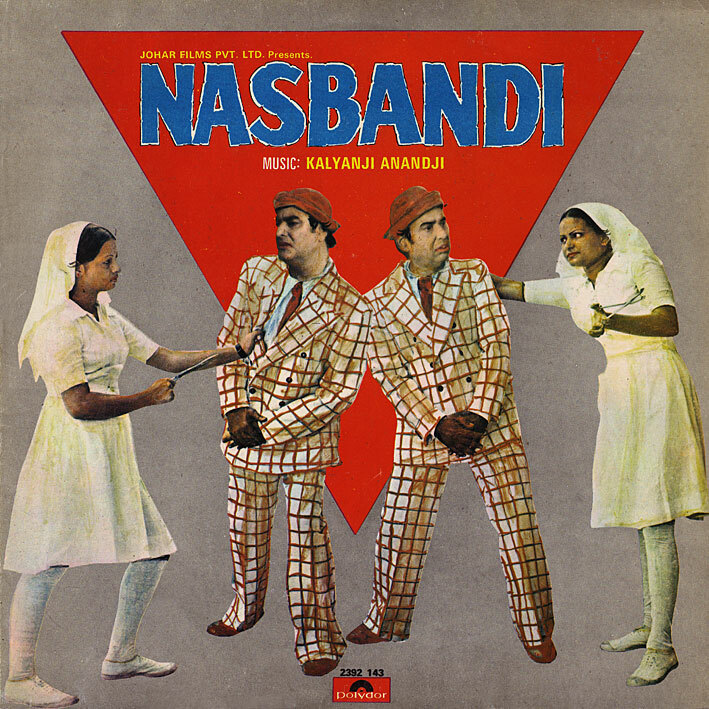 Problem is, that even though 'Nasbandi' comes from the pair's arguably funkiest (and best) period, it's not very good. Mostly dull songs, nothing special in terms of arrangement, not funky at all... I'm trying to find something worth highlighting... 'Prabhuji Dedo Ek Suntaan' and 'Kis Kamke Ye Math Mandir' are both quite nice and should warrant a listen or two, but they're hardly outstanding. I can't speak for whoever won the auction; I would have been a bit peeved though. Impressive list of singers, though! And I love the front cover :-) Thanks. Yo, thanks for the work. Track 6 is a parody of a 1958 qawwali from Al-Hilal: Humein Tau Loot Liya. :) Thanks for all the goodies again!